Vinexpo, the wine and spirits trade show, will take place from 14 to 18 June 2015 in Bordeaux. For this 18th show, the new management team is rolling out a series of new features. The exhibition site has been reorganised so that everything faces the lake and the show will offer tailor-made services for exhibitors and visitors as well as a top-flight programme of talks and tastings. In addition, Vinexpo will put the spotlight on gastronomy for the first time, with the participation of prestigious chefs and sommeliers. “Vinexpo has a history and now we are writing its future,” comments Vinexpo’s CEO, Guillaume Deglise. “And this future begins with a series of new initiatives that we’ll be launching in 2015,” he adds. The Vinexpo exhibition spaces have been completely redesigned so that everything now faces the lake. 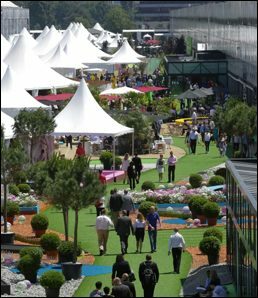 At the centre of the show, Les Terrasses will bring together the major wine and spirits brands. These premium stands will have two openings: one into Hall 1 and another on the lake side. In parallel, visitors will find new inspiration in a number of themed areas ranging from free tasting areas, a digital area, a food and wine pairing workshop with award-winning chefs and a wellness centre to a logistics advice area. This year Vinexpo is introducing an innovative new personalised database and set up targeted meetings on their behalf. So, for example, a Chilean exhibitor seeking a Singaporean importer, or a Belgian buyer looking for an Italian wine, can be assured of productive meetings at the exhibition. Getting to the show will be easier in 2015 since the tramway service linking the exhibition centre with Bordeaux city centre in 15 minutes will be completed. A major gathering of the entire industry, Vinexpo is the ideal place to sample the sector’s latest products. In 2015, Vinexpo will be organising three free tasting areas: two exploring the emerging trends for rosé and sparkling wines, and a third revisiting sweet wines. In the centre of Hall 3, the Spiritual concept bar will showcase spirits brands, with cocktails created by renowned mixologists. The catering area, also located by the lake, will be bigger with a more varied offer ranging from a gourmet restaurant to food trucks. Exhibitors will be able to bring their own wine for lunch at any of the outlets without having to pay corkage. Each evening after 10pm, Vinexpo invites all exhibition participants to a series of four fun and informal business networking parties. Called The Blend, all four events will take place at Hangar 14 on the banks of the Garonne in Bordeaux itself. Deglise says he is full of anticipation ahead of his first ever Vinexpo: "Vinexpo Overseas is part of my remit as chief executive but when it comes to Vinexpo 2015, it’s the other way round completely," he jokes. "This is the show where the world of wine and spirits comes to Bordeaux – in ever increasing numbers representing an astonishing diversity of producers and suppliers. Just look at the numbers for this year: 44 countries represented by 2,400 exhibitors. But it’s not just about size – it’s also about uncovering new products and enabling visitors to do business with new suppliers. It’s about knowledge and having all the information you need to make the best, informed decisions. "What I’m really excited about this year is the very different look-and-feel of the show. It’s much more of a city-based event this year than it’s ever been – there’s a Vinexpo and City of Bordeaux trade event happening downtown every night. "As a special guest the new ‘Spotlight on the USA’ stand will transform how the exhibition looks right at its heart, and overall the exhibition halls have been re-designed to make it easier to get around. "That’s important, because making appointments with the decision-makers and owners of wine and spirits companies from all over the world every day of the exhibition means you need to get around quickly! That’s what we’re here to do – make your time at Vinexpo easier, more enjoyable and the most productive it can be."